Your driveway puts up with a lot of punishment throughout the year. Not only do your drive your vehicles on it every day, you have to clear snow and ice off of it during the winter, and you might use it when you play basketball. While some of these activities are more damaging than others, over time you might start to notice cracks appearing in the concrete slabs or sinking edges and corners. Because it can take a long time for these problems to become visible, you might be worried that it’s too late to repair your concrete. Luckily, here at B&B Concrete Lifting in Chicago, we can help salvage your driveway instead of forcing you to completely repour your concrete. Read on to learn about how our concrete repair services work. Contact us today if you need your driveway, or any other concrete around your home or business, lifted or repaired. To prepare an area for concrete, the construction company grades the area and then compacts the soil. This is done to ensure that the weight of the concrete doesn’t cause the soil to sink in an uneven manner. However, even if this step was done correctly, sometimes the soil can compact even further over time, thanks to the material as well as the moisture content, leading to an uneven surface. The slab will then start tilting towards the areas where the soil is lower, which can cause the concrete to crack. Sometimes, due to the drainage around your driveway, water will wash away the soil underneath your concrete slabs, which can also allow your slabs to start cracking as they sink. Even if the slabs sink evenly (which is rare), it will create an uneven surface that can be dangerous to walk or ride your bike over. 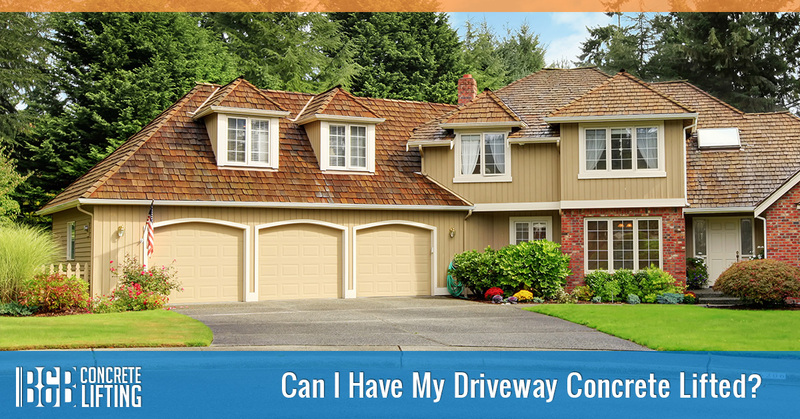 After you call us, we’ll come to check on the concrete and then offer you an estimate. Most of our clients are surprised at just how affordable concrete lifting can be, especially after they’ve received a quote to have the slabs re-poured. The process itself is relatively simple. We drill a small hole into the slab that needs to be raised and then pump a special solution under the slab. This solution is made of materials that fill the void left by compaction or erosion and lift the slab back up to its original position. The material was designed to resist further compaction and erosion so, hopefully, you won’t have to have it lifted again. When we’re finished, we fill the drilled hole with concrete, and that’s it! Having your concrete lifted isn’t just a great way to keep you and your family safe while using the driveway, it can also help increase the resale value of your home. While there might not be anything else wrong with your home, tilted and cracked concrete can make a home look like it isn’t cared for. Contact us at B & B Concrete Lifting in Chicago to find out how we can make your driveway look great!